This past week, members from across the UConn community attended a very special ceremony. 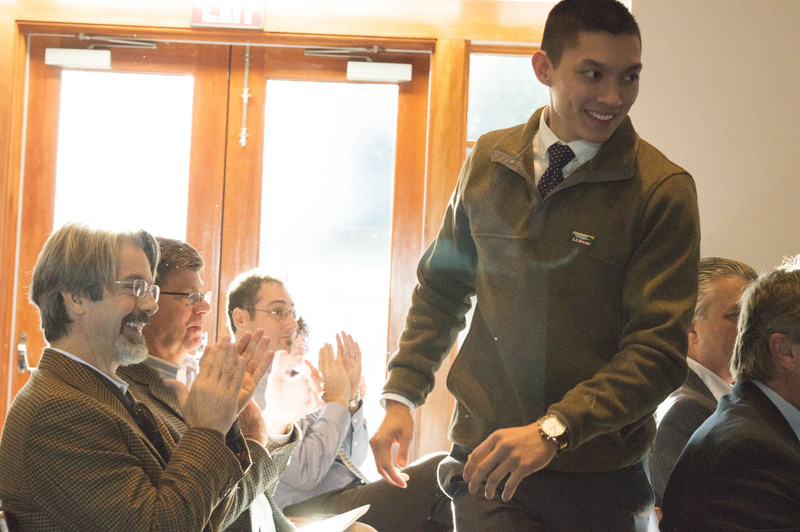 For the first time since 2012, UConn held the Environmental Leadership Awards (ELAs). These awards were presented to those who have gone above and beyond to promote sustainability in their field. The event took place on Tuesday, October 25th, in the UConn Foundation Building, where more than 80 guests, including the winner and finalists of each category, were in attendance. They were given time to network and enjoy breakfast prior to the ceremony. 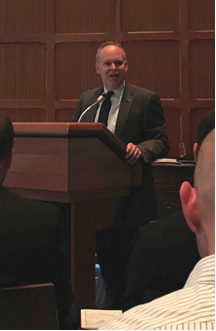 The ceremony began with a welcome from Scott Jordan, the University’s Executive Vice President for Administration and Chief Financial Officer. He congratulated the UConn community as a whole, and thanked those in attendance for helping to make the university a leader in environmental sustainability. Vice President Jordan’s introduction was followed by a brief address from Dr. Gene Likens. Among many achievements, Dr. Likens has published over 450 scientific papers on the ecological health of lakes, forests, and other environments. He is most renowned for his contributions to the discovery and remediation of acid rain throughout the 1970s and beyond. He now serves as UConn’s Special Environmental Advisor to the President. Dr. Likens emphasized the importance of community-wide dedication to environmental protection, and gave an anecdote about a Canadian town’s successful efforts to remediate a woodland polluted by copper smelting. Following, OEP Director Rich Miller and Sustainability Coordinator Sarah Munro called up the winner and finalists for each category, and summarized each person’s or group’s accomplishments. Those recognized were selected by members of UConn’s Environmental Policy Advisory Council (EPAC) from a pool of over 40 nominations. Emily McInerney Undergraduate: During her time at UConn, Emily worked at the Office of Environmental Policy, served as President of both EcoHusky and ECOalition, and conducted independent research on the relationship between climate change and wetland health. Dave Wanik Graduate: Dave conducts research on the impact of wind on electrical power utilities, and developed a model to predict these outages. He is also a member of EPAC, and helped found the Eversource Energy Center. NEMO Rain Garden Outreach Team: Michael Dietz and Dave Dickson developed an application to educate people on construction of raingardens in association with the Nonpoint Education for Municipal Officers (NEMO) Program. Spring Valley Student Farm Student Group: This farm is largely student operated. Crops are harvested and sent to several places on campus. The organization also hosts student volunteers on Farm Fridays, and promotes sustainability through their solar thermal greenhouse system and aquaponics system. Dining Services Group: Dining Services’ staff have actively promoted sustainable innovation in the university’s dining halls. So far, five dining halls have been Green Restaurant Certified, and Dining Services plans to certify all of UConn’s halls in near future. Julia Cartabiano Staff: Julia is the Manager of Spring Valley Student Farm, as well as a program organizer for EcoHouse. She organized the “Just Food! Or Is It?” symposia and Insect Wonders at the Farm program. Christopher Mason Environmental Partner: Chris has contributed lots of time and effort to promoting the health of the Hillside Environmental Education Park (HEEP). He participated in the annual BioBlitz, led trail maintenance groups, and promoted invasive species removal. Dr. Michael Dietz Alumni: In addition to developing the Nemo Rain Garden App, Dr. Dietz has served as an educator in many UConn programs. He leads tours of Low Impact Development Sites around campus, and teaches high school students during the summer at the Natural Resources Conservation Academy. Dr. James O’Donnell Faculty: Dr. O’Donnell is the Executive Director of the CT Institute for Resilience & Climate Adaptation. He also serves on the CT Council on Environmental Quality and the Governor’s Council on Climate Change. Dr. O’Donnell also conducts research on oceanography and rising sea levels. 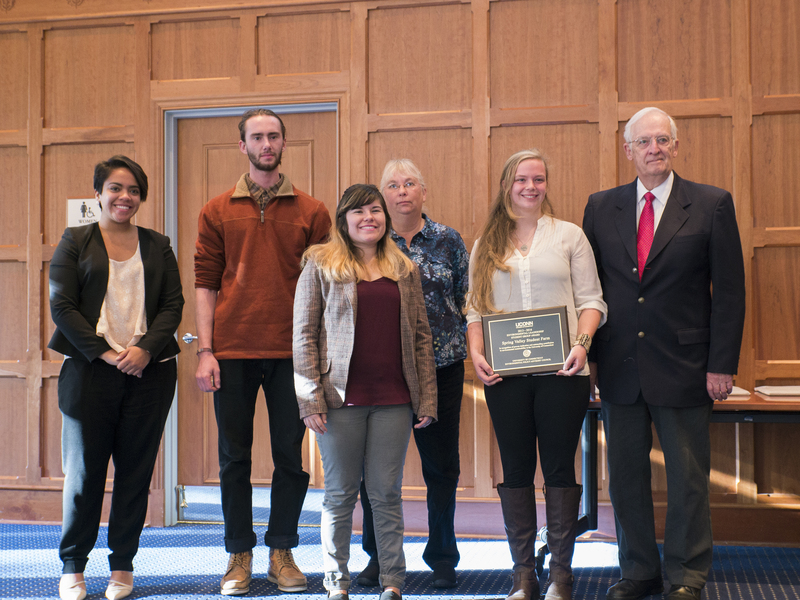 Dr. Cameron Faustman and Jillian Ives Special Recognition: This award was presented for the recent Huskies Ending Food Waste initiative. Several lectures and events were organized to promote reduction of food waste in daily life. 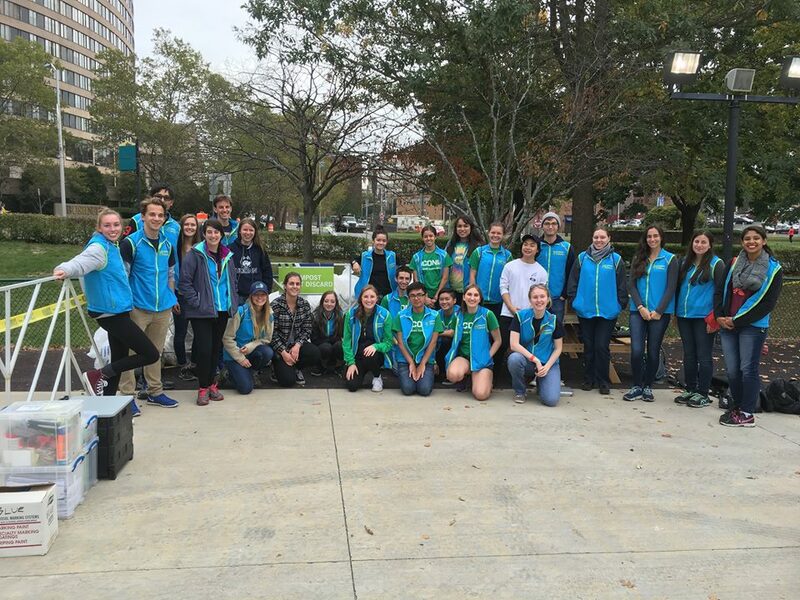 Over 30 members of EcoHusky and the EcoHouse learning community got up bright and early on Saturday, October 8th, to volunteer at the Hartford Marathon in Bushnell Park. After a quick power nap on the bus, volunteers were ready for a day of excitement, positivity, and environmental awareness. 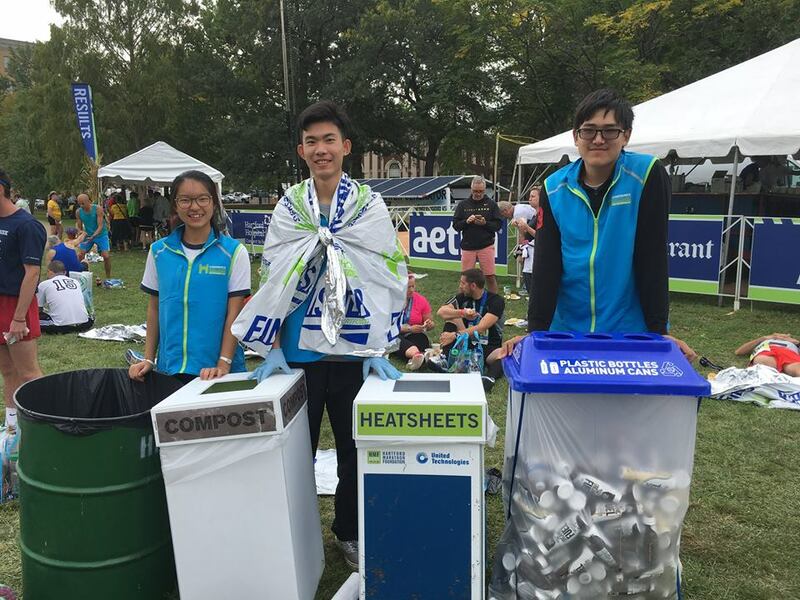 Upon arrival at Bushnell Park in Hartford, volunteers mapped out the best locations for compost and heatsheet bins, as their primary responsibility for the day was to manage the waste stations throughout the park to ensure that runners and race-goers correctly disposed of food, recyclables, and foil blankets. The Hartford Marathon Foundation has expressed strong interest in environmental initiatives over the years, with compost management as a top priority on the day of the event. Their composting partner is the KNOX Park Foundation, a nonprofit organization that partners with residents, businesses, and government to make Hartford more sustainable. This year, all of the food items on the race menu were compostable, including the soup, fruit, deserts, plates and napkins. The Marathon planners were also conscious in their other purchasing decisions, as the cups provided at the drink stations were recyclable as well. The Marathon’s efforts to reduce waste at the event are commendable; however, it was up to the volunteers from EcoHusky and EcoHouse to ensure that those efforts were seen through. Composting and recycling can have such positive waste diversion impacts, but only if the items are separated into the correct bins. Not only did volunteers ensure that this was done at the event, they also educated race-goers about recycling and composting so they could be more sustainable in their daily lives. Additionally, they tracked the bags of compost, weighing hundreds of pounds over the course of the day. In addition to manning the waste stations throughout the park, EcoHusky also had an environmental awareness tent, with an interactive basketball and recycling-themed game that encouraged players to think about what items are recyclable, compostable, and trash, then throw the items into the correct basketball hoops. 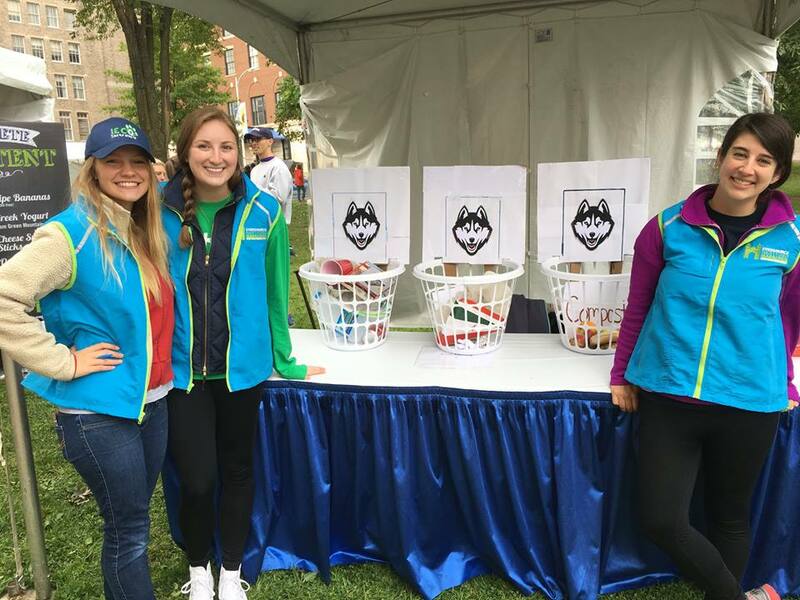 Each year, members of EcoHusky and EcoHouse refer to the Hartford Marathon as one of their favorite volunteer events. The positive atmosphere surrounding the marathon, and the receptiveness of the race-goers to the message about sustainability, consistently leave the volunteers feeling both cheerful and optimistic. As students arrived on campus for the fall semester, one of the greatest changes recognized was the newly opened NextGen Residence Hall. Construction of the new building began last November, as part of the Next Generation Connecticut Initiative, alongside a significant renovation project at Putnam Dining Hall. Both projects were unique in that they included many sustainable features, and received LEED Silver certifications. LEED-certified buildings are known for their efficiency with respect to water, energy, and greenhouse gas emissions, attributed to their carefully considered building and interior designs. NextGen Hall is innovative in both design and concept. Unlike any residence hall in UConn’s history, it houses 8 Learning Communities, one on each floor, and the design of the building is focused on providing ample community spaces and opportunities for collaboration and innovation among its residences. Great examples of this are the 1,500 square foot maker space and idea lab, which encourage craftsmanship and creativity. 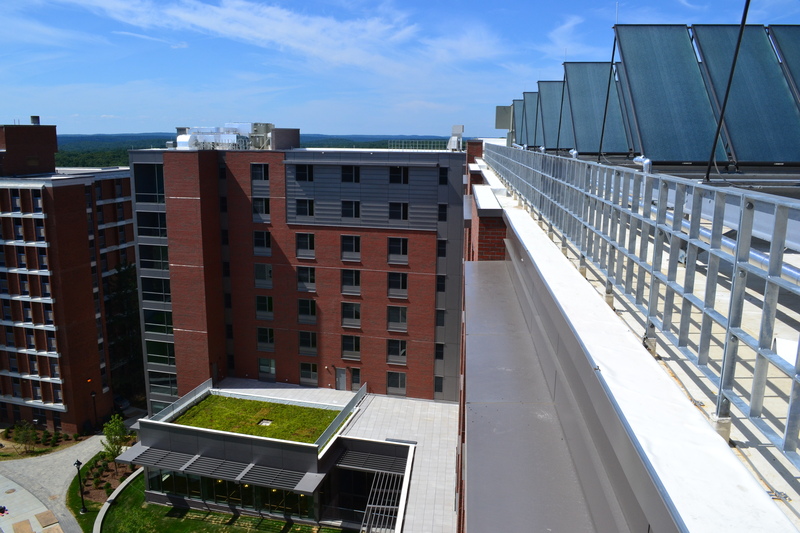 Some of the more prominent green highlights of NextGen Hall are the green roof garden and solar heating panels; however, there are many hidden features of NextGen Hall that also contributed to its LEED Silver certification. Sun shades found on the sides of the building are architectural elements that can either deflect direct sunlight to maintain cool internal temperatures, or catch the light and concentrate it inside the building to warm internal temperatures and provide better natural lighting. The light color of NextGen Hall’s roof plays a similar role in reflecting sunlight to maintain internal temperatures. Surrounding rain gardens are an example of low impact development landscapes that collect rain water to reduce runoff. The contents of rain gardens are typically native plants and soils that enhance infiltration and capturing of pollutants. Inside the building students will also find water refill stations, thermostats that monitor when windows are opened, low flow water features in the bathrooms, and an energy dashboard on the first floor that allows residents to monitor the building’s energy usage. 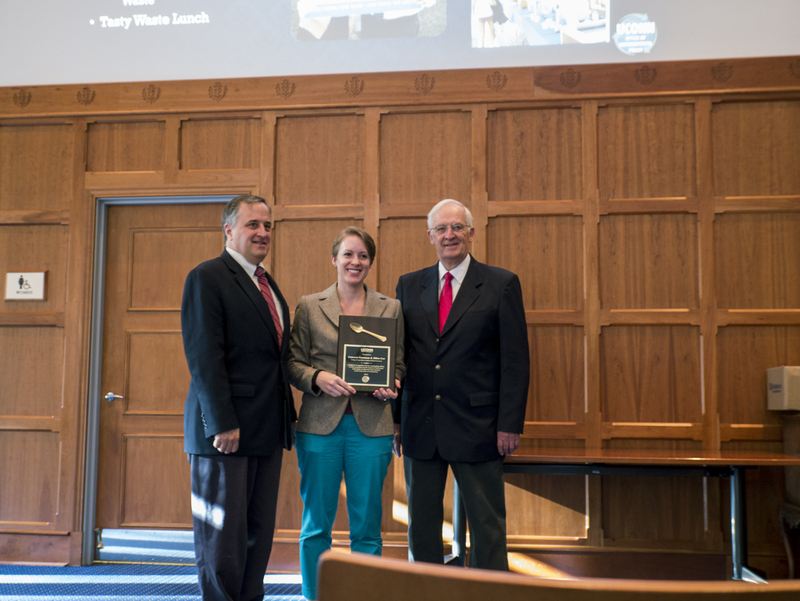 NextGen Hall wasn’t the only new green project on campus this semester; neighboring Putnam Dining Hall underwent a major renovation this past year, earning a LEED Silver rating for its building interior. 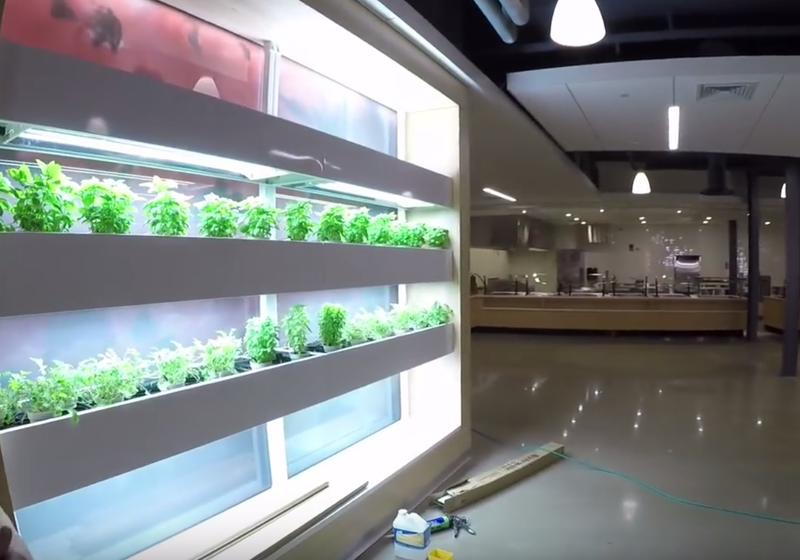 Notable features of the new dining hall include the “Living Wall” of herbs and EnviroPure food waste disposal system, among others. Putnam Dining Hall is also Green Restaurant Certified, which means it met performance standards in areas including water efficiency, waste reduction, sustainable food, reusables and environmentally preferable disposables, as well as chemical and pollution reduction. NextGen Hall and Putnam Dining Hall now stand alongside a growing number of green buildings at UConn, including Laurel and Oak Hall, the Werth Family Basketball Champions Center, and the Burton-Shenkman Football Complex. With a LEED Gold minimum standard for all new buildings and large renovations, UConn is projected to become even more sustainable as it continues to grow. Living at UConn Storrs without a car can be challenging if you are a student that likes to adventure off campus. Even the simplest trips can be difficult. Living in an apartment, I have found that I often need to rely on friends to drive me to the grocery store. Luckily, a new alternative to having a car on campus just came to UConn! 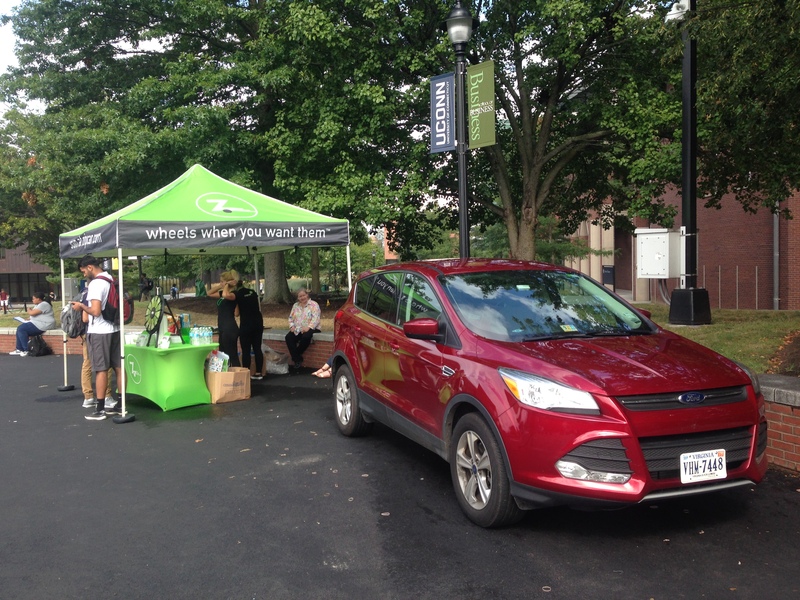 Zipcar, a car-sharing service, arrived on campus this fall. Zipcar allows students, faculty, staff, and community members to reserve cars on an hourly basis. There are currently 10 vehicles parked in several designated spots around campus. These locations include Northwest and Towers Residence Halls, Whitney Road, the Field House, and the Nathan Hale Inn. These cars are available 24/7, and after paying a $15 membership fee, can be reserved for as little as $7.50 per hour or $69 per day. After the first year, the annual membership fee increases to $25. The cost includes insurance, gas, and up to 180 miles of driving per day. Another attractive feature of this program is that unlike traditional car-rental, many of which have age limits between 21 and 24, the age limit for membership for this service is 18 for UConn students, faculty, and staff, and 21 for local community members. This car-sharing service provides a new option for students who do not have cars or cannot afford to have a car on campus. The cheapest resident student parking permit costs $122 for the year and only allows you to park in C Lot, one of the farthest parking lots from the campus core. Additionally, Zipcar represents a more sustainable option for students wishing to travel. Car sharing is an alternative form of transportation that allows for fewer cars to be driven on campus. According to Zipcar’s website, each Zipcar covers the transportation needs of about 40 of their members, and surveys show that 1 in 4 members said they would have bought a car if they had not had the option of using Zipcar. This represents a significant number of cars not on the road. In this way, car sharing has the potential to reduce greenhouse gas emissions because fewer students may bring cars to campus in light of this option. Furthermore, this may reduce the need for parking spaces on campus, and Zipcar could act as a Low Impact Development, or LID, feature by reducing runoff. Thus, having this new car-sharing service at UConn will not only give students the option to be more independent, but also allow them to reduce their environmental impact. Personally, I used Zipcar just this past week, and I found the process easy to navigate. After reserving a car using the Zipcar app on my cellphone, I was able to get the car at the parking lot in front of the UConn Field House, and drive from there. I unlocked the car using my Zipcard, which was sent to me in the mail. The actual car keys are left in the vehicle. The Zipcard is used to pay for gas, so that you do not have to pay for gas out of your own pocket. The car that I drove was clean and new, and my trip was smooth. When I had finished with my travels, I simply returned the car to the place where I had found it (a spot clearly marked where only Zipcars are allowed to park), left the keys in the car, and locked the car using my Zipcard. A few hours later, I received an email with trip details and the total cost. I found my Zipcar experience to be very convenient, and I would recommend it to anyone who does not have a car and is looking to make a quick trip to the grocery trip, visit a friend, or go on an adventure. Along the way, you can feel good knowing your decision will help our community reduce its carbon footprint, and make UConn a more sustainable place to work and play! Click here to join Zipcar! This week marks the beginning of the Tenth Annual EcoMadness Competition! Over the month of October, students in over twenty residence halls will be competing to reduce their water and energy consumption. To reduce their dorm’s energy and water consumption, students undertake a variety of tasks. Energy can be saved by using desk lamps with LED bulbs, unplugging devices when not in use, and washing clothes with cold water. Water can be saved by taking shorter showers, doing laundry with full loads, and shutting off the sink while brushing teeth. These simple activities have reduced some residence halls’ energy and water consumption by as much as 35%! To lead their dorms to victory, the Office of Environmental Policy calls on residents to volunteer as EcoCaptains. These students post fliers and posters around their residence halls, organize activities, and provide weekly updates to the OEP on how the dorms are doing. The winning dorm for each category will receive a certificate and a free ice cream party in November featuring Dairy Bar Ice Cream! Find out more about EcoMadness here!